Noor’s track moved forward considerably in this episode and the most important aspect of this track was that for the first time Noor openly told someone about his true identity. Noor has accomplished a lot with the help of Mikael and due to the confidence he has in himself. He has a vision and is constantly working to make his goals become a reality. I wasn’t sure how I would feel about Noor and Sania’s track and where it was headed but so far this development has made the story more interesting. I am waiting to find out how it is handled in the future. Noor introduced Sania to his mother, this was like leading her on knowing that she might have feelings for him although that wasn’t Noor’s intention. There are times when Noor is shown as someone who is highly sensitive and receptive and there are other scenes in which he is shown as someone who does things impulsively too. In my opinion these shortcomings in Noor’s character make it more relatable and human. Noor also sensed that perhaps Mikael had feelings for his mother and it looked like he would like to see them both together. The scene in which Noor shared his feelings with God would have been a lot more impactful if those dialogues were written differently. The way these dialogues were penned down made Noor sound like someone who was complaining more than relying on Allah. While it is okay for someone to complaint to God every now and then but it did seem like the writer wanted to convey a different message. It would have been better if this scene conveyed that Noor saw an ally, a friend in God instead of someone who had been unfair to him. 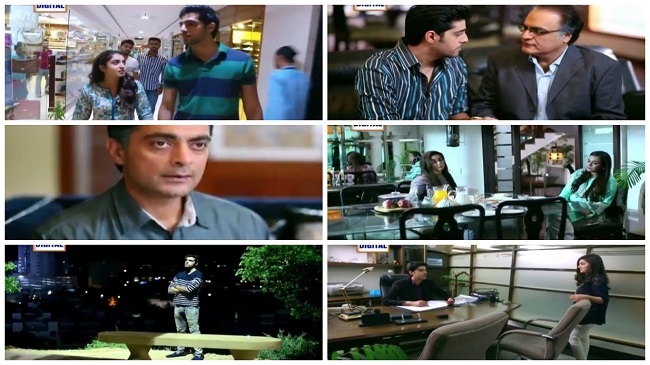 Kashmala and Zain’s track has been going around in circles; their scenes never have anything new to offer. There has been absolutely no change in Zain, he never even paused to think about his child and the decisions he took in his life. He keeps on saying that he is still in love with Mahi and has been unable to live a happy life with Kashmala but that somehow isn’t enough. Arshi has also not changed a bit in all these years. She has always seen herself as a victim and has not budged from her initial stance. These tracks are stagnant because there has been absolutely no character development. H on the other hand has finally figured out what he wants to do now therefore it is easier to connect to the changes in him. Mahi decided to get married to Mikael in the previous episode and it will be good to see them together. Mahi and Mikael have been shown as positive individuals who deserve to be happy. Aly Khan and Aisha Khan look good together and fit perfectly in their respective roles. Although some of the tracks in the story have come to a standstill but Noor’s track has been handled well so far. The preview of the next episode was disappointing because it focused on those tracks which are stagnant at the moment. The viewers are more interested in what happens in Noor’s life next instead of watching Kashmala and Mahi fight over Zain!! How many of you watched this latest episode? Do share your thoughts about this.